● Aric Almirola started Stage 1 in the 18th spot and finished it in 11th. ● The entirety of the stage was run under the green flag. ● The Round of 8 contender pitted during the stage break for fuel, four tires and adjustments to help the No. 10 machine. The pit stop resulted in a 13th-place restart for Almirola in Stage 2. ● Almirola started Stage 2 in 13th and ended it in 10th. ● The first caution of the race was displayed on lap 96 while Almirola was in 12th. Crew chief John Klausmeier made the call for the No. 10 machine to stay out on the track and restarted in ninth. ● The second caution of the race was displayed on lap 135, and Almirola came down pit road for fuel, four tires and adjustments once again. He restarted 13th on lap 140. ● The Tampa native finished Stage 2 in 10th. ● During the Stage 2 break, Almirola visited pit road for two right-side tires and fuel to start the final stage in seventh. ● Almirola started the final stage seventh and ended it in the fourth position. 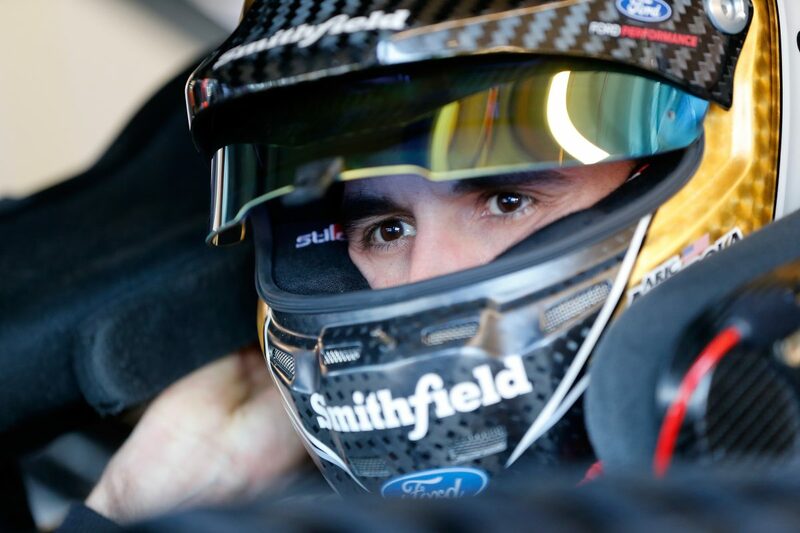 ● On lap 170, Almirola reported the Smithfield Ford was “very loose to get going,” and after slipping back to 10th he worked his way back up to eighth. ● The 34-year-old made a scheduled green-flag pit stop on lap 226 from the seventh position. Unfortunately, the caution came out just after Almirola pitted. ● He restarted 16th on lap 236 and worked his way up to 13th when the caution came out on lap 240. ● The seventh caution came out with 49 to go while Almirola was in the 10th position. He came down pit road for fuel, four tires and adjustments. After a brief red flag and with varying pit strategies among competitors, Almirola restarted 12th on lap 269. ● Just after the restart, a multicar accident brought out the caution again as Almirola ran in seventh. ● The green flag dropped again on lap 275, and the Ford driver had maneuvered his way up to fourth when the ninth caution came out on lap 287. Almirola stayed out during caution and restarted fourth. He raced teammate Kevin Harvick for position until the 10th caution of the race came out on lap 296. ● Almirola restarted in the second position on lap 300 with his best shot to win the race and move on to the Championship 4 at Homestead. Unfortunately, he was overtaken by another competitor and ultimately finished fourth when the remainder of the event ran under the green flag. ● This was Almirola’s fourth top-five and 16th top-10 finish of 2018. This is the most top-fives Almirola has earned in a single season in the Monster Energy NASCAR Cup Series. ● Almirola earned his first top-five in 16 career Monster Energy NASCAR Cup Series starts at Phoenix. His previous best finish at Phoenix was seventh, earned in the series’ March race at the track. ● Almirola finished 10th in Stage 2 to earn one bonus point.